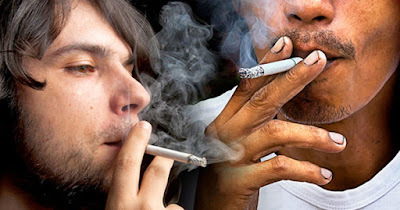 African American Smokers Vs. White Smokers -- Who Are More Likely to Get Diabetes? The risk of diabetes is 77 percent higher among African Americans than among non-Hispanic white Americans, according to the U.S. Centers For Disease Control. But that risk can be even higher if African Americans are heavy smokers. A recent study shows that heavy smoking greatly increases the risk of diabetes in Blacks. The study involved nearly 3,000 people, mostly women, who did not have diabetes. The study showed that those who smoked at least a pack a day may cause diabetes in Blacks and that both diabetes and smoking are tied to cardiovascular disease. The rate of new cases of diabetes among smokers in the study who consumed at least a pack a day was 62 percent higher than those who never smoked. Although the percent of African Americans and whites who smoke is the same, diabetes is more common among black adults than white and Hispanic adults. The study revealed that there was more fat around the abdomen, called visceral fat, in current smokers. This is believed by researchers to be one of the reasons why smoking may increase the risk of diabetes. The study did not reveal that smoking causes diabetes; but smoking can increase the risk for diabetes. The best prevention is not to start smoking in the first place. It is much more difficult for older adults to quit after years of smoking.